Instagram, the iPhone-only social network for sharing photos with your friends, has released a major new version of their app today, which reaches version 2.0 and adds a number of new features, updated interface design, and a new icon. The most notable change in Instagram 2.0 is the implementation of live filters. In previous versions of Instagram, every time you took a new photo with the app's dedicated camera UI you had to apply a filter after the photo was taken, and if the filter was not okay for the photo, you were obviously forced to go back to main screen and re-shoot. Having to retake a photo to make it play nice with a selected filter could lead to several problems -- your favorite "moment" may be gone forever, and you'd end up with multiple shots to choose from. In Instagram 2.0, the camera screen has been completely re-imagined to accomodate live filters and tilt shift -- meaning, you can see how a filtered photo will look like before you take it. 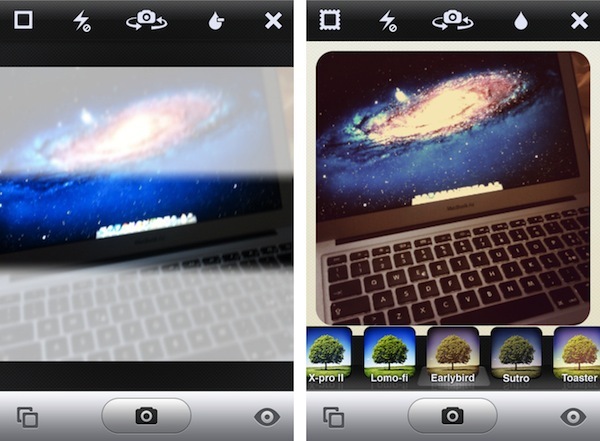 Thanks to iOS' powerful live image editing and photo-taking functionalities, the developers have been able to develop a solution that lets you instantly see how filters will apply to your photos -- no need to shoot and apply separately. 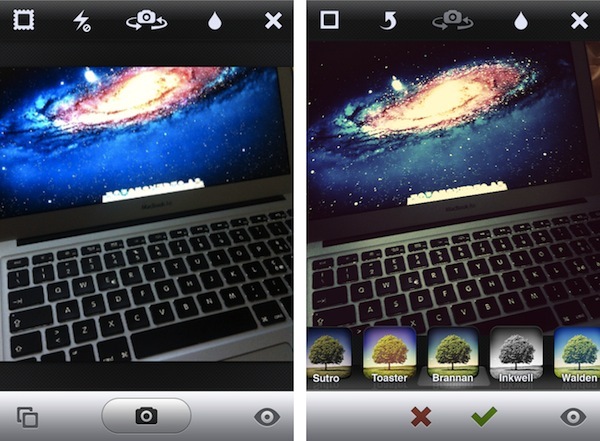 From this new camera view, you can scroll filters at the bottom, or play with a series of buttons along the top. These buttons let you snap a photo without borders, activate/disable flash, swap cameras, or tweak live tilt-shift. The latter option is particularly amazing when seen in action, as it updates the camera view in real-time with different types of tilt-shift as you tap on the screen. 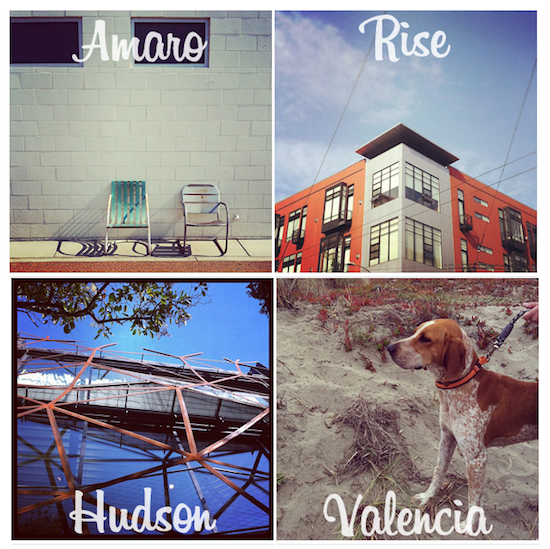 Alongside being able to see how filters will look like before taking a photo, Instagram version 2.0 comes with four new effects (Amaro, Rise, Hudson, and Valencia). Users can still decide to take a photo without effects and apply them later (simply don't tap on the filters icon in the toolbar), but from what I've seen so far, performances of this update on the latest iPhone hardware really make for a fast and smooth experience when playing with live filters. We tested the feature on an old iPhone 3GS and the transition between effects was very smooth on that device, too. The Instagram developers say the new filter engine is up to 200 time faster than before. The new Instagram is also geared towards giving users more control over how their photos are snapped, and shared with the world. Besides being able to remove borders and rotate a photo after it's taken, photos are now saved at much higher resolution in a device's library -- photo size has been increased from 612x612 to 1936x1936 on the iPhone 4 (1536x1536 on the iPhone 3GS). This was one of the biggest complaints with the original Instagram, and the developers are surely on the right path to deliver an app that's equally fast at sharing photos, and saving them at high quality. As the service is now nearing 10 million users, it's interesting to look back at my initial review of Instagram last year and see how much has changed. In spite of the new features introduced today -- a refreshed interface, live filters, higher photo sizes -- Instagram is still the same app that allows users to share photos with a new "social paradigm". Instagram has reinvented the way photos can be "beautified" and shared on mobile devices to multiple social networks, ultimately building a social network on its own that's now attracting millions of users and popular brands. You can find Instagram 2.0 on the App Store.